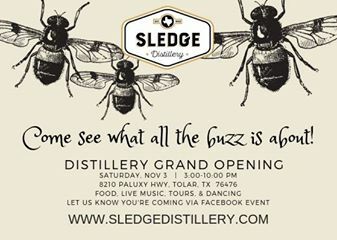 The Sledge Distillery and event venue featuring live music, and open-air dance floor, a 6,000 square-foot banquet hall and cooking under the stars will hold its grand opening this Saturday. Bobby Davis will perform from 3:30 PM - 6:30 PM and Calamity Janes will perform from 7:00 PM - 10:00 PM. Come out and enjoy the festivities and the good autumn weather.